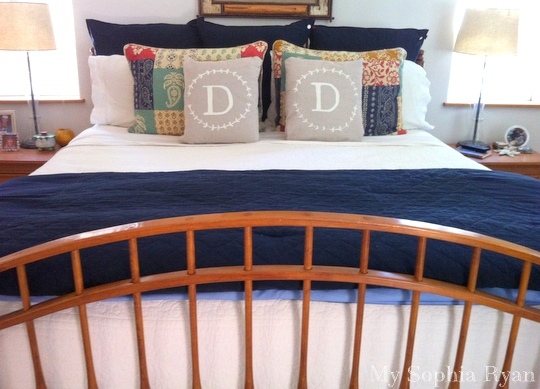 These DIY Monogram Pillows were Featured in Shutterfly! It was a proud moment. Having a blog and committing to it is a lot of work. Most of the time it’s rewarding & fun. However, there are times it feels discouraging. You have days you question what the heck you are doing. Being acknowledged by anyone let alone a huge company like Shutterfly gave me the inspiration I’ve needed to get back in the swing of things. 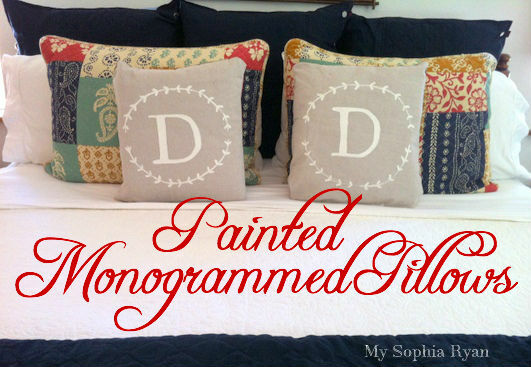 Monogramming pillows with paint turned out to be a simple project. Actually, I did it in bed last night before going to sleep. It was that easy. 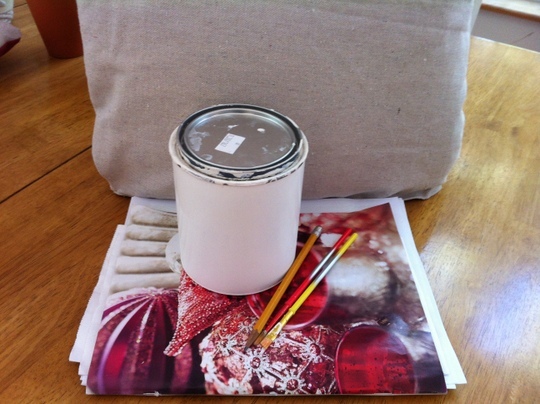 I had already covered two pillows with paint drop cloth fabric. 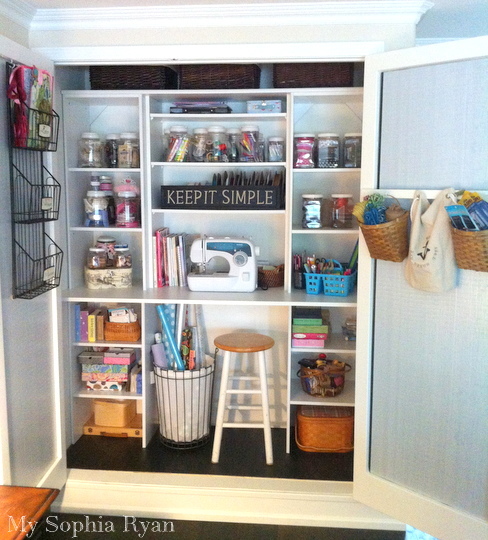 I like using drop cloth because it is durable and it looks like linen. 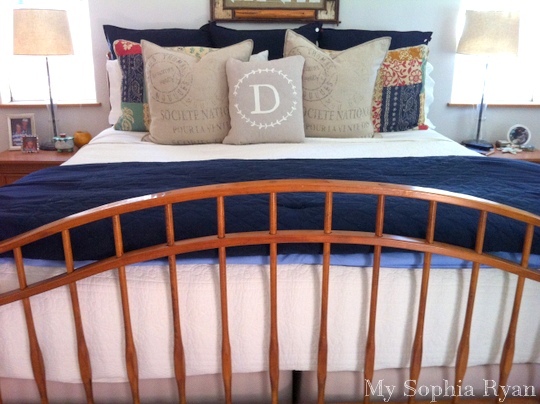 If you don’t sew, you can buy plain colored or linen pillows. I used off white paint, a fine paintbrush, 2 drop cloth covered pillows, a piece of paper, pencil, and scissors (to create a stencil). I ran out of ink for my printer so rather than printing out a large letter, I traced it from my computer screen. 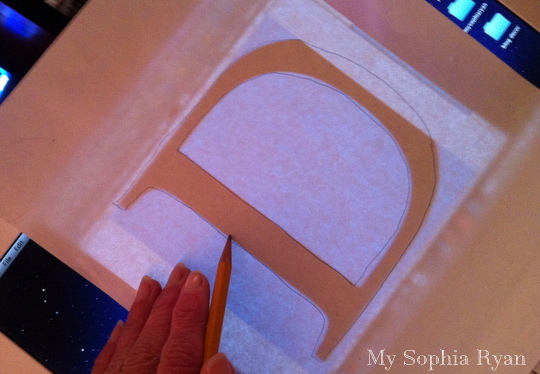 I like making my own stencils because I can pick the font I like and the size I want. 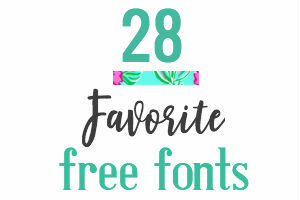 The font I used was Antiqua, size 600. Next, I filled it in with paint. I created this design without using a pencil. It was very simple. I painted two half circles and then painted almost like a heart shape on the half circles with about an inch in between each one. As you can see, it is not perfect but when finished, it looks good enough. It does not need to be perfect to look good! Take a step back and admire your work! 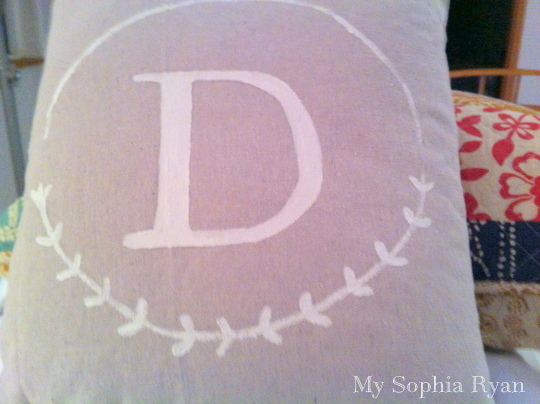 I was planning to just make one, then decided to get rid of the big linen restoration hardware pillows and make a second monogrammed pillow. 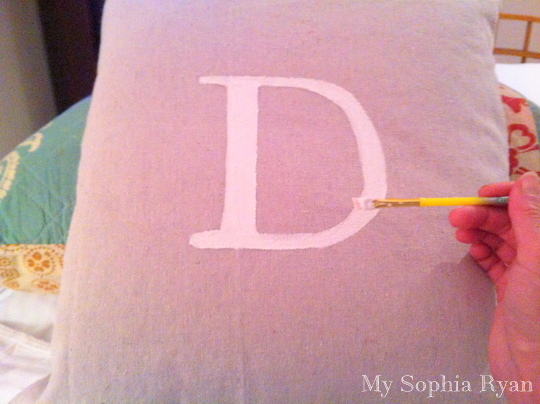 There you have it, simple to make painted monogrammed pillows. 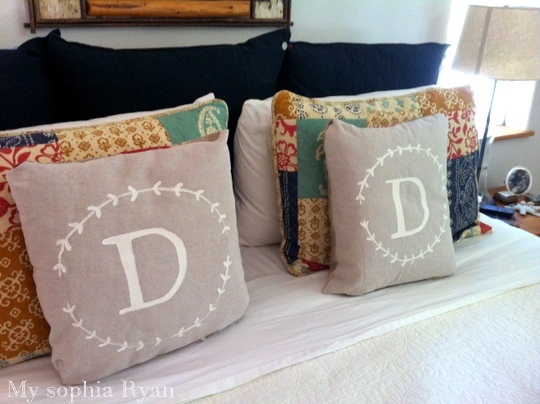 They came out so good that these DIY monogram pillows were featured on Shutterfly. 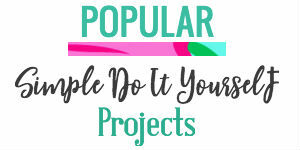 You’ve got to give this project a shot. Thank you! I love monograms too! I appreciate you stopping by. 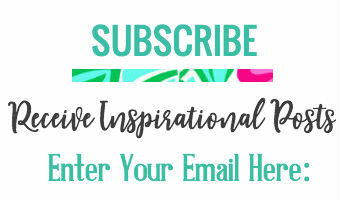 I just checked out your blog and you’ve got great inspiration on there. I’m going to link up next Monday. Thanks again for your feedback. Kelly those look so great!!! 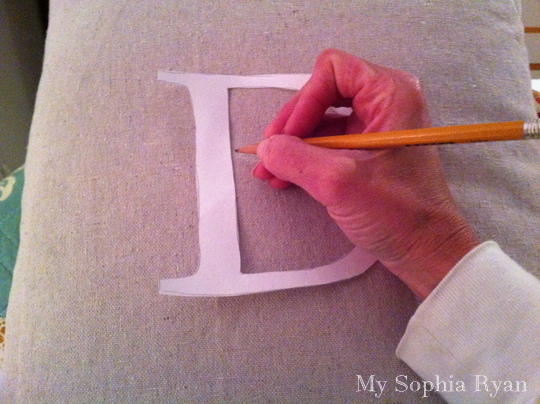 I love monograms too…..you are so creative!! Thank you Darci! You’re always so sweet! I love these pillows, they look amazing! Thank you for your feedback. I just linked up at your party and checked out your blog-lots of great stuff. Thanks again for stopping by! Thank you! I will definitely link up to your party. Thank you so much for the invite. Such cute pillows! I need to paint a pillow again. 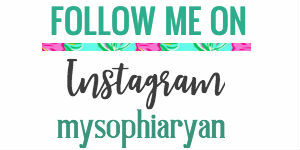 I’m featuring them in the PoPP Spotlight this week. Thanks for linking up. Thank you so much. I’m glad you like the pillows. They were fun to make! 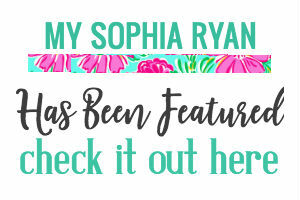 Thank you for featuring them in the PoPP Spotlight- I’m excited! 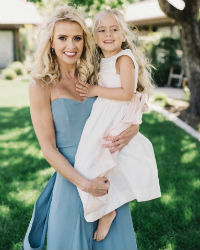 Found you through the Sweet Bella Roos party, these are so cute and I will be sharing them on my Facebook page today! Thank you for stopping by. They were fun and simple to make! These are beautiful! I cannot wait to try out your technique. 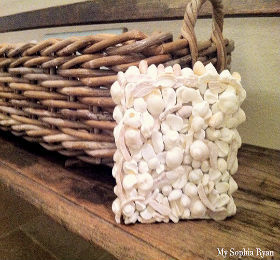 I included these in my favorite picks round up from Co-hosting Take a Look Tuesday at SugarBee Crafts. Thank you so much! They were very simple to make! Thanks again Jane. It really is pretty simple but you might practice a couple times on a piece of paper. You made my day with your comments! Thank you. I love your pillow idea! Great job. 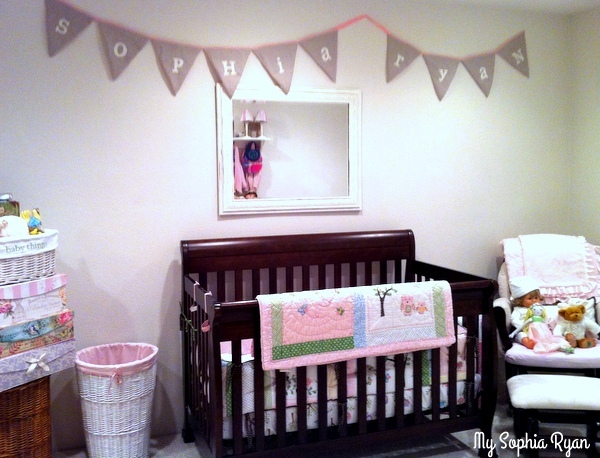 Thanks for linking up to centerpiece Wednesday and sharing this with us. These turned out so well! They look great on your bed! Great job! Awesome! 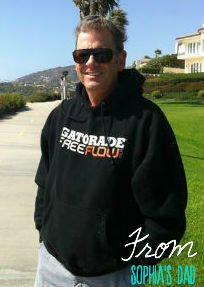 Thank you so much for visiting and for featuring me! These are just darling, Kelly! I loved this project! I’m Featuring YOU on VMG206 ~ Brag About It Tuesday’s Linky Party from last week! We go live Monday at Midnight. So please stop by and grab a Feature Button and Link Up something new. Thank you for stopping by and for hosting the party! I’ve been wanting monogram pillows or something along the lines or Mr. & Mrs. pillows. Still on the fence but I want them to turn out like this! That is so sweet! They were very simple to make. Thank you so much for such a nice compliment and for stopping by. This is perfect!! 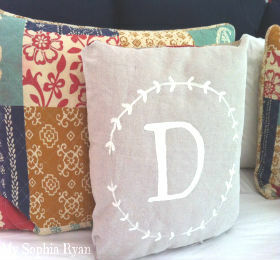 I am having a Pillow Week on my blog and for my last set of pillows I wanted to write something on them. I was thinking I would have to give in and buy some stencils. What a brilliant idea! Use my computer screen! Thanks so much! Love your pillows!!! Great job!! I have been looking for something like this. And I am glad I found you. Thank you for sharing. Pinning it. Thank you so much for featuring me! That is such a compliment. I’m inspired to paint something new. I love your blog and will link up again! They are pretty cute and would be a great Christmas gift! Thank you so much for featuring me. I’m enjoying visiting your blog. Thanks again. Thank you so much for featuring me. I love your blog!